The Ambassador Building was a seventeen-story building in the heart of Downtown St. Louis that housed one of the city’s most elaborate theaters beneath eleven stories of offices. The building was developed by theater magnate Spyros Skouras’s Skouras Brothers Company. Designed by noted theater architects Rapp & Rapp, who had also designed the St. Louis Theater (1925, now Powell Hall), the building balanced baroque terra cotta ornamentation at the base and griffin-adorned cornice with a powerful, plain brick shaft. Inside, the lavishly detailed 3,000-seat theater employed a French Renaissaince Revival style associated with the “Sun King” Louis XIV. After several years as a music venue, the theater closed down in 1976. The fixtures of the theater went to public auction in 1989; the chandeliers are still found in the Des Peres Cinema in West County. Mercantile Bank demolished the Ambassador in 1996 and 1997 to create space for a driveway to the Mercantile Tower (now the US Bank Tower). The St. Louis Building Arts Foundation recovered the terra cotta ornamental systems. The two brochures reprinted here were distributed by the Isaac Cook Company, a real estate company that managed the Ambassador’s office space. 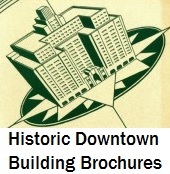 The first brochure was published in 1925 ahead of the building’s opening, in a successful attempt to draw tenants. The second brochure is undated. This page written by Michael R. Allen with Laurel Morris.